I’m feeling a little lost. This is the time of year when my thoughts would be turning towards planning my ‘Who Do You Think You Are? Live’ adventure. But, as was announced last year, this is a show that won’t go on. Yes, the writing may have been on the wall with the massed ranks of so-called chuggers, aka charity muggers, in evidence last year. Stand space was expensive making it difficult for genuine family history organisations to have a presence. Even The National Archives gave it a miss. Is this a sign the popular interest in family history research has plateaued and is perhaps on the decline? And, dare I say it, maybe the TV show ‘Who Do You Think You Are?’ has struggled occasionally with who it thinks it is in recent series. Yes, there are some gems of episodes. But it doesn’t seem to hold the same thrall of its early days. The BBC have also seemed happy to tinker with scheduling, to the detriment of viewing continuity, possibly an indication of where it now stands in their pecking order. No longer a flagship viewing offering? But is that in part because the format needs a shake-up? Also has the series encouraged the belief family history is quick and easy? The big Internet and associated ‘it’s all a mouse-click away.com’ con, which in turn fostered the ‘fast-food family historian’ in us all to some extent. That attitude led to some of the more informative talks at last year’s ‘Live’ show, such as ones about genealogical proof, being a step too far for some of the audience. It’s too much like hard work, all this checking, corroborating and building a body of evidence. I personally feel the absence of a national show has left a huge void in the British family history calendar of events. But maybe that’s because I’m a tad family history research obsessed. I’m going to miss its social aspect, the chance to see what’s out there beyond my own family history interests, the informative talks to improve my skill set, not to mention the opportunity to grab a book bargain or subscription discount. I’m seeking out alternatives, from the ‘Secret Lives’ conference to local and regional events and talks. One source to find out what’s on is GENEVA, an online calendar of GENealogical EVents and Activities. On the same era-ending theme, earlier this month the final edition of ‘Your Family History’ magazine plopped on my doormat. Or should I say I dashed to the newsagent to buy my final copy, as my subscription expired the previous month and no reminder to renew was sent? For 15 years, initially under the title of ‘Your Family Tree’, it has provided information, advice and tips for the family history community from beginner to the more advanced. But time has been called on the publication. Reasons cited for its demise included rising costs and competition from the Internet. This competition presumably extends to digital media, blogs, podcasts and the like. But again I’m left wondering if the appetite for family history research has levelled out. The family history landscape is changing. In reality it has always been a constant evolution. But the Internet is the real game-changer in recent years, considerably speeding up the process. I started my family history journey probably just after the launch of ‘Your Family Tree’ (as it was called then). Back then it was old fashioned painstaking research methods. None of this ‘everything only a mouse click away’ belief, too often implicitly peddled by T.V. programmes and family history subscription sites now. Online subscription-based genealogy database services were in their infancy. IGI and FreeBMD were my high-tech, online ports of call. Microfiche and microfilm readers, Family History Societies and visits to local libraries and archives provided my gateway. I well remember the days of going to my local library and scrolling through the census. Ditto for parish registers. I’d even plan holidays to visit archives in family associated locations in order to fit in a few hours research. This for basic record sets like the census or parish registers, things we take so much for granted today. Hard to imagine, but it wasn’t online and neither did it come automatically with a helpful searchable index. If you were lucky the local Family History Society might have compiled an index booklet. Or maybe an antiquarian publication had reproduced them. But, as the Family History Society exhorted, you still needed to check the original document. But in the main you were ‘indexless’, and it was the long job of scrolling through filmed copies of the census, or going through the parish register microfiche by microfiche noting down all occurrences of family surnames. And maybe repeating the process, as research turned up a new surname to track in the same parish….several times over. But that way, you did get to familiarise yourself with the records, the community in which your ancestors lived and the writing! It’s hard to imagine that this was how we did family history only a few years ago. Today, subscription genealogy services are in constant competition to get the next big dataset online. This is today’s gateway to family history. Yes, it is brilliant there is so much out there to tempt people into the wonderful world of family history. It’s making family history more accessible. And it can save masses of time in travelling up and down the country on archives visits. But in the race to get it all online, clear source referencing along with precise coverage dates, seems to have been dismissed. For instance the unwary may assume Ancestry’s West Yorkshire Parish Register collection includes all parishes. It doesn’t. But finding out what is there, and the years covered, is not an easy task. And transcribing errors may in turn lead to false negative results. In a way it’s become too big, too unwieldy and the race to ‘chuck stuff online’ has meant it’s been too organisationally chaotic. For many there’s that initial flurry of interest, but it all tails off. And make no wonder people give up. It can be like plaiting fog. Especially when you don’t fully understand what’s there in the first place. I’ve heard people admit to it. They start off enthused but then they soon find it all too overwhelming and lose track (and interest) in what they’re doing. In a way, the Internet may have curiously decreased knowledge too. There doesn’t seem to be the same willingness to trawl through a parish register, the Quarter Sessions or a Borough Court register to check for yourself. It’s too much like hard work. Yet there are times when this is necessary. For many it now needs to be the quick click, instant gratification of an online search and move on without evaluating whether it’s right or wrong. And hey presto I’ve got a tree going back to 1066! A corollary is because so few are prepared to put in this painstaking work, the amount of time it takes is not appreciated. For so many there’s no interest in finding out about the variety of records, what they can and can’t do, what pitfalls there are, and what alternative sources exist to plug gaps. Which is why the demise of knowledge-bringing magazines such as ‘Your Family History’ is such a loss. I’m forever seeking out information and knowledge to develop my family history skills: be it reading, both online and traditional books and magazines, as well as attending talks, webinars, podcasts and formal learning courses. I’m currently signed up to a series of Guild of One Name Studies monthly webinar. There are so many sources of learning out there if you look. And by doing them and improving your knowledge, you’ll be amazed how much you learn which in turn will lead to more accurate family trees, and hopefully breakthroughs. But that’s the point: you have to know the limitations of online sources and actively seek out knowledge beyond the confines of your computer. And by seeking out this wider knowledge you become more acutely aware of the computer pros and cons. And yet there still seems to be only a passing realisation that not everything is on the internet. There is so much more in archives waiting to be explored. Much of it will never make it onto these online providers such as Ancestry, FindMyPast or The Genealogist because it is not commercially viable. Who for instance would be interested in churchwarden accounts, Vestry minutes, charity records, manorial documents and the like for some obscure location? But often these documents may help prove a link. Bottom line, these companies are only interested in what makes money. After the 1921 census, what will they use to generate income and fresh interest? Perhaps this goes some way to explaining why price structures are amended; why Ancestry is putting its more recently acquired UK military datasets not on Ancestry.co.uk but on sister-company Fold3, in order to get another subscription stream; and why there is such a push on DNA testing as an alternative cash-cow. I’m not against DNA testing per se. It has a place. It is another tool. But there is perception peddled that it’s a quick root to a fully formed family tree, with no research required. By the same token cash-strapped Councils, looking to make savings, are cutting back archives opening hours, or even closing them, because so much is online. Read the same for local libraries. It’s an easy excuse for them to use in order to reduce costs. And so it’s all online becomes a self-perpetuating myth. Which is why I think David Olusoga’s recent BBC2 series ‘A House Through Time’ was such a refreshing change. Not only was it interesting, engaging and informative, it was a new way to introduce people to family history. It didn’t propagate the ‘it’s all online’ impression. And it wasn’t afraid to admit some people were difficult to trace and the trail went cold. Hopefully it has reached out to, and inspired, a new set of family historians, those seekers and keepers of documented, accurate ancestral truth, memories and knowledge. In my last post, in response to the latest Kirklees Council budget threat to our library service, I wrote about the value of libraries. 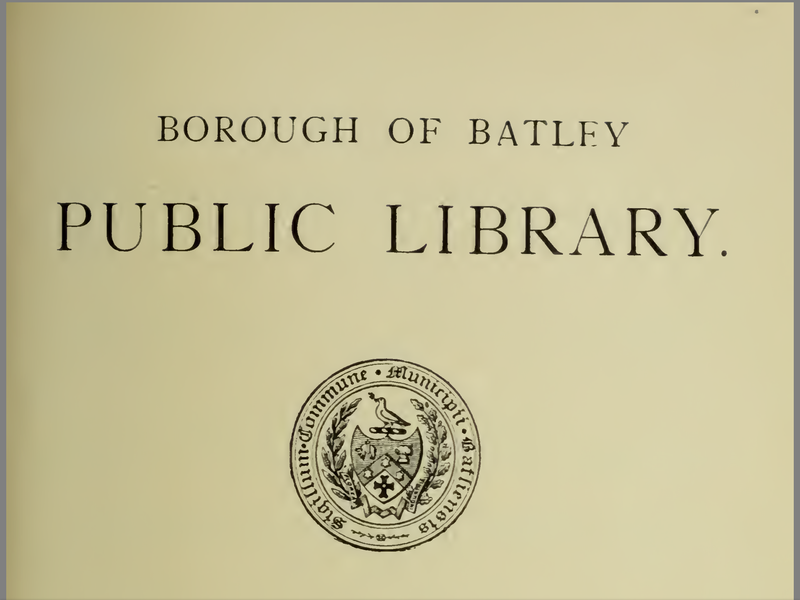 In this post I look at the early days of my local library, Batley, the services it offered to the local community and their reading habits between 19 October 1908-March 1915. Batley library’s establishment epitomises the enlightened thinking of late Victorian/early Edwardian Corporations, industrialists and philanthropists. They had the vision to see the immense benefits libraries provided for education, the economy and wider society. From access to books and knowledge for all, irrespective of background and finances; to the realisation that an educated workforce could contribute to industry and the country’s wealth; from the morally and self-improving leisure opportunities they afforded; to the social benefits this offered in terms of crime reduction. These may seem old-fashioned concepts, but they are relevant still today. The 1850 Public Libraries Act established the principle of free public libraries. A subsequent amendment in 1855 Act allowed boroughs to charge an increased rate of 1d rate to fund the provision. It proved insufficient, with by 1869 only 35 places opening public libraries. This is where philanthropists such as Andrew Carnegie stepped in. The son of a Dunfermline weaver, the Carnegie family emigrated to America in 1848 when he was 13, settling in Allegheny, Pennsylvania. Starting off as a bobbin boy, he was fortunate to have access to books as a result of the generosity of a local man who made his library available to local working boys. Self-taught from these books, Carnegie progressed from the bobbin mill, to become a messenger at a telegraph company, then a telegraph operator, eventually moving to the Pennsylvania Railroad where he rose to become a superintendent, age 24. From there his investment and business interests developed, resulting in his steel company. Carnegie’s experience instilled in him the belief anyone with access to books, and the desire to learn, could educate themselves and improve their position in society. Free libraries provided such educational opportunities for those without financial advantage. In 1901 he sold his company to J.P. Morgan for $480m and was free to devote himself totally to his philanthropic works. His personal experience of the benefits books provided, led him to donate money for the building of 2,509 Carnegie libraries between 1883-1929. 660 of these are in the UK. By doing this he felt his grants would inspire communities to take ownership for their libraries and be responsible for looking after them going forward. 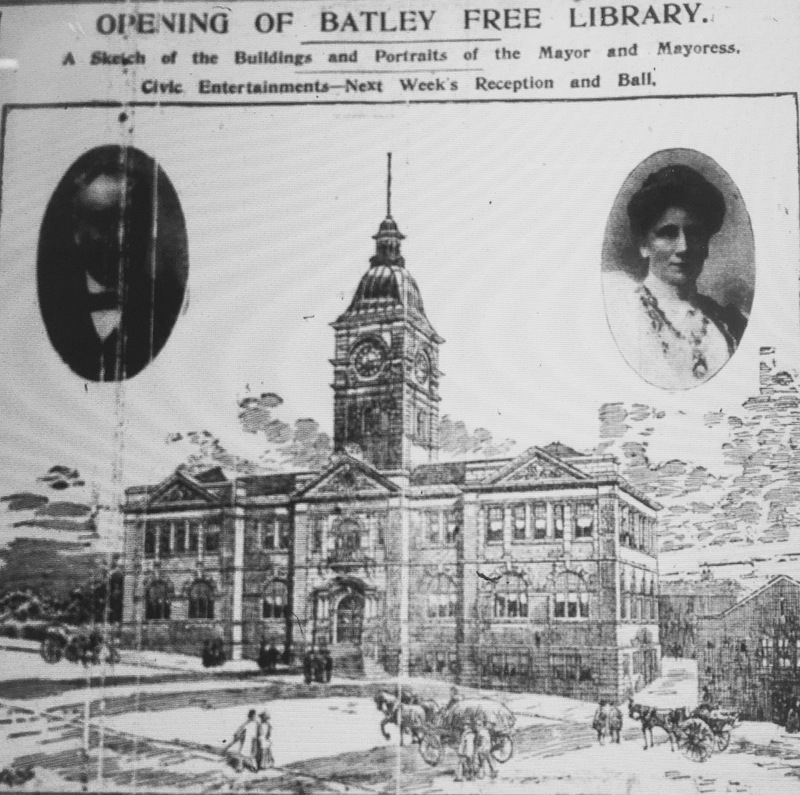 Batley did have a couple of libraries: Batley Cooperative Society and Batley Working Men’s Club & Institute, lending around 700 books per week between them. However, neither were free to the general public. Accordingly Batley Corporation approached Carnegie. Lauded as a progressive community, in January 1903 the Corporation received confirmation he was prepared to donate £6,000 subject to the normal rules, including providing a site and adopting the Free Libraries Act and under this raising £400 per year for its maintenance via the maximum 1d rate. He subsequently provided an additional £988 for the clock tower. A transfer from gas rates added another £1,914 16s 6d. 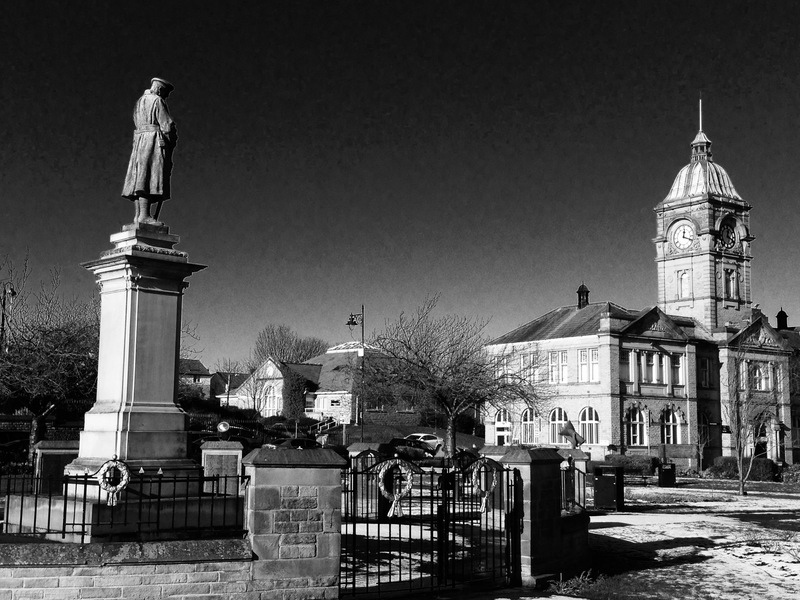 Batley’s achievement was a cause of envy for neighbours, and rivals, Dewsbury. The Ackroyd Trust provided land specifically for a library and the Foundation Stone for the iconic market place building was laid on 18 July 1905. Designed by Messrs. Walter Hanstock & Son, at a cost of £8,902 16s 6d,, Batley’s Carnegie library officially opened on 19 October 1907 with an initial stock of 7,260 volumes. It offered lending and reference libraries, a librarian’s room, news and reading rooms and a ladies’ room. The first book borrowed, by the Mayor, W. J. Ineson, J.P., was the Bible. The early days of the library are portrayed in its annual reports. In the early years these reports ran from 19 October – 18 October, the 12 month period from the library opening. This changed in 1911. That report ran until 31 March 1913, 17.5 months. Thereafter the year fell within traditional 1 April – 31 March patterns. The library had a staff of five. The 2nd annual report for the year 19 October 1908-18 October 1909 shows these comprised of librarian Alfred Errington, assistants James H Shaw and Alfred North, and caretaker Alfred Moody. Later staff in the period included assistants Annie E. Newsome, Winifred M. Peel and Evelyn M. Walker and caretakers Nelson Howard and Arthur F Garner. Their hours were long – the reading rooms opened from 8.30am-9.30pm; the work painstakingly labour intensive with many hours spent on tasks such as producing a catalogue of holdings, or repairing books. In the year ending 1914/1915 they installed a small binding plant to allow staff to do more of this repair work in-house, but the librarians had so little spare time it did not receive much use that year! These reports provide a fascinating insight into the early days of the library. The Table below shows some figures illustrating its development. A few things struck me. Firstly the somewhat bizarre ladies’ lavatory income. In 1908/9 it raised £2 7s 8d, rising to £4 11s 5d in 1914/15, by which time men were presumably being charged to use the facilities, as the “ladies’” element was dropped and the money raised had almost doubled. The library staff were also extremely efficient in chasing up book returns and fines, with personal visits made to those unresponsive to postal reminders. The 1d rate increase was implemented, despite some early dissenters. By 1914/15 this raised £567 towards the running costs of the library. Finally, on the surface to modern eyes, how little things cost. For example a £58 5s 9d payment to Mr W.H. Sykes of Batley in summer of 1913, for cleaning and redecorating, the first refurbishment since the library’s opening. In 1914/15 annual salaries and wages stood at just over £280; electricity, gas and fittings a shade over £40; rates, water and water rents £21 8s; and, reflecting the fuel supplies and industrial heritage, a shade over £16 was spent on coal. At today’s values fuel prices of £56 would equate to just over £4,000. A common theme of the early reports is the initiatives taken to increase the popularity of the library. The number of borrowers, talks attended, books issued, their range and number attracted much attention. Adaptation, development and improvement featured in those early days, as much as today. The key difference appears to be the store those local government officials put on the value of a library providing a levelling opportunity for all, a theme much in evidence right from the opening ceremony. Maybe that’s the difference between then and now. Back then folk had to really dig in and fight for the basics; today things are taken for granted and consequently undervalued. Special Student Tickets, introduced in 1908/09, allowed readers an extra ticket for non fiction works. The reference library boasted a substantial body of coal mining books; textile trade volumes were materially extended in the period 1911-13, all relevant to the predominant local industries, in the hope of attracting Technical School students. A winter season of half-hour library talks and lectures commenced in January 1908 to attract people to the library. These covered literature, science, art, music and travel, some accompanied by lantern shows. The themes ranged from “A Talk on Elementary Astronomy” and “The Norse Mythology, an influence on the Development of Anglo-Saxon Character”, to “John Milton“, “Individual Responsibility and Social Reform”, “What and How to Read”, and “The Story the Brontës”. Children were catered for too, with Walter Bagshaw giving talks on subjects such as “Peeps into Sunny Italy” and “Reason and Instinct, or, Do Animals Think?” One speaker was Rev Fr John O’Connor from Heckmondwike, a great friend of G.K. Chesterton. “Fr. Brown” in the Fr. Brown novels is based on him. Appropriately one of his talks was entitled “Belloc and Chesterton”. By the end of the 1914/15 season 77 talks has been given. That season saw the highest average attendance, 97. 1914/15 also saw the commencement of talks by the local branch of The Workers’ Educational Association. Reading circles were established and adapted, moving away from subjects such as Shakespeare’s Henry V to more populist contemporary subjects such as Kipling, to boost participation. Photography, travel and water colour exhibitions also took place, the latter featuring originals by J.M.W. Turner and attended by over 5,000. In 1909/10, the substantial increase in loans of juvenile fiction led Mr Errington to urge the library committee to extend the privilege to borrow books to under 14s. April 1912 marked the launch of a School Library scheme in partnership with the Education Committee. Initially six local schools participated: Hanging Heaton, Brownhill and Staincliffe CofE, Carlinghow Boys, Warwick Road Boys, Healey Mixed. Each school received 50 books on rotation, and by 31 March 1913 over 8,000 volumes had circulated. By 31 March 1914 four further schools joined the scheme: Mill Lane, Gregory Street Girls, Purlwell Boys and Warwick Road Girls. In the three years to 31 March 1915, 33,287 volumes were issued via the school scheme and a further 37,226 by the Juvenile Section of the lending library. 20 per cent of these were non fiction issues. More schools were applying to join, and head teachers reported the beneficial educational impact of access to good books. However, a formal, dedicated Young People’s Department did not open in the library until 1928. Another 1912 development was the August introduction of the Open Access system, where borrowers could browse the library. Prior to this they had to ask if a book was available, and wait for the librarian to fetch it. Theoretically the closed system reduced book theft, but did little to encourage reading. By 1915 Mr Errington proudly announced that of 160,000 volumes issued under Open Access, not a single volume had been lost. The library reports give a wonderful snapshot into the times and community. From the weather, the exceptionally fine summer of 1910 blamed for a decline in the number of books issued; to war, with the average number of books issued per day declining from 221 in 1913/14 (library open 269.5 days) to 219 in 1914/15 (open 280.5 days), due to the numbers in H.M. Forces and overtime in the mills. Noticeably, enrolled women borrowers shaded men. And war saw reading choices shifting to lighter options with loans of fiction, literature, music and juvenile works increasing. The only other category seeing an upturn was sociology, because it included army and navy books. The array of over 20 railway timetables testified to the importance of this mode of transport. The wide range of newspapers and magazines, numbering in excess of 100, in the reading rooms demonstrated the importance of the print media in these pre-wireless and TV days. Their titles illustrated the interests of the time and the local industries, including “Fur and Feather”, “Farm, Field and Fireside”, “Sons of Temperance”, “Weldon’s Ladies’ Journal”, “Colliery Guardian”, “Textile Recorder” and “Waste Trade World”. The library reading rooms for a short time even boasted “Die Woche”, reflecting the area’s textile manufacturing links with Germany. Unsurprisingly, this publication disappeared from the shelves by 1914/15. And what does this have to do with family history? Well, besides the plethora of family history resources offered by libraries today including local history reference resources (not online), newspapers (not on the British Newspaper Archive/FindMyPast), access to subscription sites like Ancestry, and local censuses and parish registers on microfilm/fiche there is the actual library history. The development and history of a local library itself adds context to the lives and times of ancestors. The annual library reports are name-rich sources. Not only of the great and the good, those on the Committee and those who donated or gave talks. But also the library staff. This is an extract from the report for year ending 18 October 1910 WW1: “James H. Shaw, the Senior Assistant, resigned in June to take up duties in the office of the Borough Accountant…..Mr A. Moody, who held the post of Caretaker since October 1908….had to relinquish his post on account of ill health”. James H. Shaw is one of the Healey residents identified for the Healey Great War project. For me the library reflects my ancestors’ community, their hopes, aspirations, dreams and lives. I imagine them using Batley library right from its inception. And I thank those enlightened people of the early 20th century. What a great gift to the town. I’ve timed this post to mark World Book Day 2017, to acknowledge the important role local libraries have played in opening the world of books to many generations. 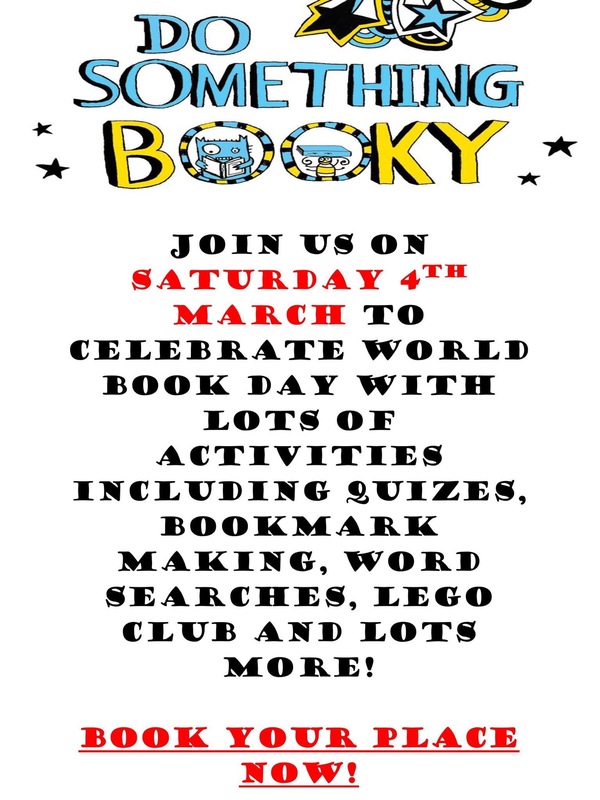 The poster below shows events at Batley library on Saturday 4 March. Henry Ward Beecher’s quote is something I truly believe. Sadly I don’t think Kirklees Council understand it. Less than a year on from the last round of council cuts which prompted me to write about the important roles libraries play in family history, it appears with the latest council budget vote we are now on track for a cull of unprecedented proportions. Last year, following a public consultation, Kirklees closed two of its 26 library branches. However, it ceased funding a further 14, handing them over to community groups and volunteers to run. 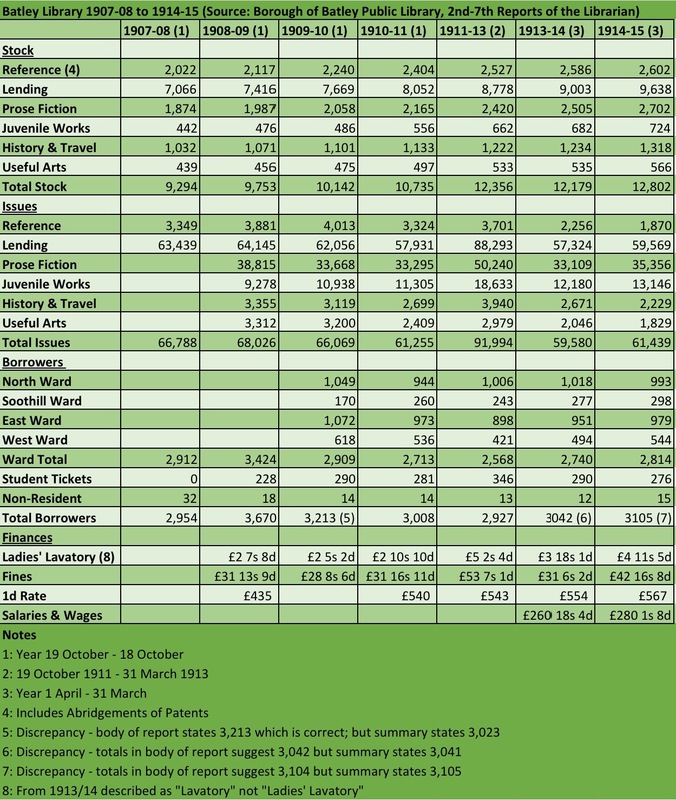 The numbers of council staff employed in the remaining libraries were slashed and opening hours reduced. Batley library cut its weekly opening hours from 48.5 to 35 in September 2016 as a result. This appears to be just a taster of things to come. “Public Libraries News“, in article at the end of January 2017 entitled “USA and Canada see library usage rise: 3/4 budget cuts in Walsall and Kirklees” reported Kirklees would have a £1.7m cut to the library budget 2017/18 (from £3.9m to £2.2m). This equates to £1.85m cuts from start 2016 to end 2018. This is on top of last cut of £1.8m cut in 2015/16, meaning budget cut by 72% cut in three years. In effect, as a result of these latest cuts, we will be looking potentially at just two funded libraries (Huddersfield and Dewsbury) to serve the entire population of around 435k and rising in the Kirklees Metropolitan Council area. Arguably one of the worst library culls nationwide. I’m not getting into the whys and wherefores for these cuts. It is undeniable that councils like Kirklees face a major central government funding recession, and Kirklees receives government funding way below the national household level. However, to quote Eleanor Crumblehulme: “Cutting libraries during a recession is like cutting hospitals during a plague“. Sadly, libraries are not seen as an essential service. Mention bins and folk are up in arms because it has a direct everyday impact on all households. Cuts to libraries, museums and parks don’t have the same impact. As a result, fewer people stand up for them in any tangible way. Councils know this. They know where the main battles lie. Libraries, and broader culture, are easy targets. However I believe libraries must be seen as an essential community resource. They are used across all age-groups. They also have a big influence in drawing together a diverse community. In the words of Libba Bray “The library card is a passport to wonders and miracles, glimpses into other lives, religions, experiences, the hopes and dreams and strivings of ALL human beings, and it is this passport that opens our eyes and hearts to the world beyond our front doors, that is one of our best hopes against tyranny, xenophobia, hopelessness, despair, anarchy, and ignorance“. Libraries play a part in the Jo Cox legacy about combatting loneliness. This in turn has links to community health and well-being, with mental health being high on the political agenda. One in three adults aged 16-74 (37 per cent) with conditions such as anxiety or depression, surveyed in England, were accessing mental health treatment, in 2014. Overall, around one in six adults (17 per cent) surveyed in England met the criteria for a common mental disorder (CMD) in 2014. Around one in four people every year develop anxiety, depression or other related conditions. Libraries have a vital role in combatting anxiety and depression. They are a window on an outside world, providing a safe, welcoming social hub. Besides the range of self-help books, they offer volunteering and socialising opportunities. They host activities, crafts, community groups and surgeries for local politicians at council and government level. They have newspapers. There are talks and a wide range of exhibitions. They offer computers, internet access, printing and photocopying. There are events for children. Batley has Memory Lane Café sessions for those experiencing dementia. In February the library hosted a bowel cancer screening information session with a GP registrar. This is the February Batley library newsletter, highlighting the wide range of services. Libraries engender a love of books from an early age, aid literacy and afford an opportunity for learning and development, outside of school. Not every child has access to books or computers at home. Not everyone has transport or can afford to travel if their library closes. They are a repository for local history and civic pride. They, and other public amenities such as Town Halls, markets, Post Offices, Police Stations, swimming baths, technology colleges, shops and even Job Centres are things that draw people into a town centre. Start removing them and bit by bit the town centre declines, becomes delipidated, deserted and eventually a crime-ridden no-go area. Libraries are also free. To quote Lady Bird Johnson “Perhaps no place in any community is so totally democratic as the town library. The only entrance requirement is interest“. And Anne Herbert was spot on when she said “Libraries will get you through times of no money better than money will get you through times of no libraries“. But to get back to my key message about the Council library budget annihilation. It’s all well and good people grumbling and complaining about cuts to local services. I’ve seen many social media moans about how unfairly communities outside the central Huddersfield are treated. But how many of these people actually use their local library? By the time they wake up it will be too late. Years later they will laud the halcyon days of libraries and rue their unavailability for their children and grandchildren. But through their inactivity they shoulder the blame for this loss alongside any government or council. So, my challenge to all those who say they value their library and community: Don’t sit back and throw sideline pebbles which achieve nothing. If you don’t want to lose your library now really is the time to show your support. Get out your library card, visit your local library, get involved, and start borrowing some books and e-books (yes libraries embrace technology). Beyond that, lobby your local Councillors. Write to your MP asking they raise the funding issue at government level. Bombard the local media with letters. Challenge. Use. Support. And do your utmost to “Save Your Library“. At the moment I’m angry: bitterly angry and disappointed. 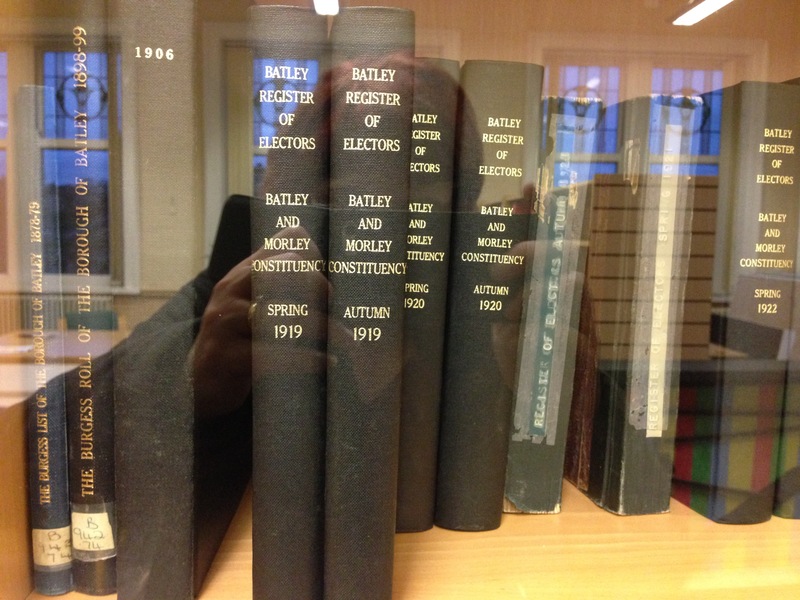 I went to Batley library on 3 December to check out the 1918 Electoral Register held in the reference section. I was horrified to discover it missing. I couldn’t believe it. I spent a full hour checking the shelves in the reference library, not just the cabinet in which the full range of registers are housed, in the vain hope the book had been mis-filed. All to no avail. I last looked at the 1918 register in October 2015, when I made some notes about my family. This time I wanted to use it for my Healey project. The register showed absent voters and indicated by a “NM” if they were in the navy or military. For some of those serving their country this may be one of the only surviving records of their sacrifice. Because of this it is arguably one of the most important of the Batley electoral registers. Maybe someone has borrowed it. Though as its a reference book, and no one on duty in the library knew it was missing, I think I’m clutching at straws here. Cynically I think whoever has taken it knows exactly it’s value. To my mind the alternative, and most probably the most likely, unpalatable option is it has been stolen. If this is the case, I reckon it is permenantly lost. Unless someone’s conscience is wracked with guilt. I do hope it is. If it is gone forever I’m disgusted. Disgusted that someone has taken from the community what is a vital resource for those researching family or WW1 history. Shame on them. I hope they’re really pleased with themselves for robbing everyone, including those named within the pages of the register, of their history and legacy. An utterly despicable act. But I doubt they have a shred of remorse about it. If they had, to take it would not have crossed their mind. Personally I can’t get my head round why anyone would be so selfish. The book was available. They had library access to it. Why take it? It is a sad indictment on society that someone felt it their right to behave in such a despicable way. I’m now left trying to source an alternative copy, preferably locally. So far without success. This is not one of the electoral registers available on commercial sites. If anyone knows of the (preferably) local whereabouts of a copy of the register, please let me know. It could be the difference in me discovering the WW1 service of a Healey man. And because of one person’s lack of morals and callous disregard of doing the right thing, many others will be similarly deprived of such an important local resource. Update: I am pleased to report that the 1918 Electoral Register has now unexpectedly re-surfaced. It was not in the locked cabinet where it should be housed. Library staff discoverd it tucked away behind books elsewhere in the library. My Healey Project has a new lease of life. My local library has been so much a part of of my life I can’t imagine a world without it. It has been there at all stages: from the magical joy of childhood stories; to the text and reference books for my school studies; the escapist pleasure of novels transporting me to different worlds, times and places from my armchair (or bus seat); and full-circle taking my own little girl to choose her first books. But more than that: 10 years ago it provided my gateway to family history. When I took my first tentative family history steps, they took me to the familiar surroundings of Batley library. There I got used to operating the microfilm and microfiche readers to look at the local censuses, newspapers, parish registers and cemetery records. There I practised deciphering old handwriting and making transcripts and abstracts. In those early novice days I don’t think I would have dreamed of going to West Yorkshire Archives. The prospect was far too daunting. It would be full of experienced, serious researchers. Not a place for a “newbie” like me who didn’t have a clue what a microfilm reader was, let alone how it worked. I felt far more comfortable going to my local library where I knew the staff. And they had endless patience showing me what records were available and how things worked. Their holdings provided a very local focus. Beyond the newspapers and parish registers they had those peculiarly local resources, often provided by researchers with a love of and affinity with the area. From the card index of local War Memorials compiled by Christopher Frank, (I still don’t know who he is but I’m eternally grateful to him because it was through his index that I had the jolting realisation that one of my ancestors was on the Memorial, a fact never mentioned by the family), to the research piece by Janice Gilbert on “The Irish in Batley”. Even now my local library is a go-to family history research location. It is still the place for local newspapers – neither “The Batley News” or “The Batley Reporter & Guardian” are on the British Newspaper Archive or FindMyPast. Not all West Yorkshire Parish Registers are on Ancestry. There are resources such as Batley Cemetery Records, Batley Borough Council minutes, Directories, Batley Grammar School Magazines and various programmes, brochures and memorabilia from a multiplicity of local events. Then there is the wonderful Soothill War Register which I wrote about in a recent post. One of my particular library favourites are the annual Reports by the Batley Borough Medical Officer of Health. I briefly referred to them in “A Short Life Remembered“. They provide a fascinating and detailed insight into all aspects of health, disease and social conditions of my Batley ancestors: from school-by-school statistics of Batley children, to breakdown of causes of death; from birth rates and infant mortality to incidence of infectious diseases. I find them an invaluable source for giving context to the times, lives and deaths of my ancestors. They even have free computers, Wi-Fi and Ancestry access! The impressive Batley Market Square library building is steeped in history. With funding from philanthropist Andrew Carnegie it opened to the Batley public in 1907. I imagine my ancestors browsing through the thousands of lending and reference library books or catching up with latest local, national and international events in the newspaper room. And over a century later I am researching the lives of those ancestors in the very same building. In an era of Government spending cuts and their knock-on impact on Council funding for services, libraries are easy targets. “My” library was a fundamental first step up the genealogy tree all those years ago; and it is just as relevant for me today. I do so hope that such valuable community hubs, important at all stages of life, are not lost. Given the subject it seems appropriate to post this on World Book Day.